This is one of the most special projects of my career. 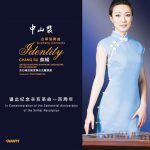 Identity: Zhongshang Zhuang is a concerto for orchestra and guzheng (“GOO-jung”), or Chinese zither. The piece was commissioned by Victor Cheng, a Chinese businessman in the United States with a long history of supporting classical music. Victor had a vision of merging the Western romantic orchestra with a 3800-year-old Chinese folk music tradition, and making both accessible to a worldwide audience. I was fortunate enough to join him in bringing that vision to life, and composed and orchestrated the three-movement, half hour concerto. Victor, an avocational musician, contributed two themes that recur during the music. To date, Identity: Zhongshan Zhuang has had over twenty performances in China, Canada, and the United States. It’s been performed by such ensembles as the San Francisco Symphony, the Chicago Sinfonietta, and the China National Orchestra in Beijing. Score and parts rental for performance available from Janen Music. Internationally-renonwed guzheng virtuoso Su Chang has been soloist at every performance of the piece to date. Her expressiveness and skill with the instrument is a wonder to behold, something both part of and transcending the music itself.